ATR Group is a growing company with a long history of providing solutions for our customers. Our employees are our best asset and we encourage a working environment where it is natural to be passionate about delivering excellence and going that extra mile for our customers in a safe and efficient manner. We employ all engineering disciplines (mechanical, electrical and hydraulic), workshop technicians, qualified inspectors and office based staff (sales, marketing, design, project management and administration). 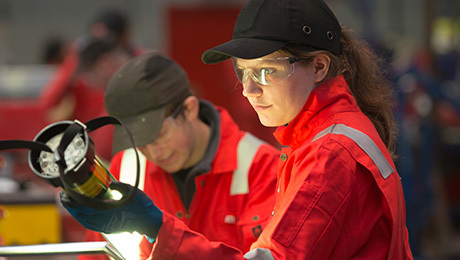 We offer recognised apprenticeship schemes and training programmes for those new to the industry, whilst also actively encouraging our employees to participate in our training programmes to further develop their skills and progress their careers. Unsolicited CV’s are accepted for potential future positions. Responsible for carrying out inspection, maintenance, repair and test of air and electrically operated tools, both customer owned and within the hire fleet. Hand Arm Vibration testing of both ATR and customer owned equipment. Portable appliance testing of all electrically operated tools. The job holder may be required to carry out any other related or associated roles, tasks or duties, which they can be trained, instructed and supervised to do safely and according to changing business requirements. Knowledge – of all types of hand and powered tools, compressors, generators, etc. To carry out statutory thorough examinations on lifting equipment in accordance with relevant legislative standards, ATR procedures and client procedures where applicable. The most commonly used regulations are: Lifting Operations and Lifting Equipment Regulations 1998 (LOLER) and The Merchant Shipping and Fishing Vessels (Lifting Operations and Lifting Equipment) Regulations 2006, other regulation may apply depending on the geographical location.